DHCP Options, Option Format and "Option Overloading"
These are miscellaneous options that control the operation of various applications and services (Table 197). Network Information Service Domain: Specifies the client's NIS domain. Contrast to option #64. Network Information Servers: Specifies a list of IP addresses of NIS servers the client may use. Servers are listed in the order of preference for the client to use. Contrast to option #65. Network Time Protocol Servers: Specifies a list of IP addresses of Network Time Protocol servers the client may use. Servers are listed in the order of preference for the client to use. Vendor Specific Information: Allows an arbitrary set of vendor-specific information to be included as a single option within a DHCP or BOOTP message. This information is structured using the same format as the Options or Vend field itself, except that it does not start with a magic cookie. See the end of the previous topic for more details. NetBIOS Over TCP/IP Name Servers: Specifies a list of IP addresses of NetBIOS name servers (per RFC 1001/1002) that the client may use. Servers are listed in the order of preference for the client to use. NetBIOS Over TCP/IP Datagram Distribution Servers: Specifies a list of IP addresses of NetBIOS datagram distribution servers (per RFC 1001/1002) that the client may use. Servers are listed in the order of preference for the client to use. 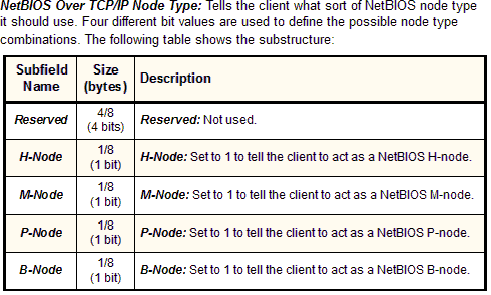 NetBIOS Over TCP/IP Scope: Specifies the NetBIOS over TCP/IP scope parameter for the client. X Window System Font Servers: Specifies a list of IP addresses of X Window System Font servers that the client may use. Servers are listed in the order of preference for the client to use. X Window System Display Manager: Specifies a list of IP addresses of systems running the X Window System Display Manager that the client may use. Addresses are listed in the order of preference for the client to use. Network Information Service+ Domain: Specifies the client's NIS+ domain. Contrast to option #40. Network Information Service+ Servers: Specifies a list of IP addresses of NIS+ servers the client may use. Servers are listed in the order of preference for the client to use. Contrast to option #41. Mobile IP Home Agent: Specifies a list of IP addresses of home agents that the client can use in Mobile IP. Agents are listed in the order of preference for the client to use; normally a single agent is specified. Simple Mail Transport Protocol (SMTP) Servers: Specifies a list of IP addresses of SMTP servers the client may use. Servers are listed in the order of preference for the client to use. Post Office Protocol (POP3) Servers: Specifies a list of IP addresses of POP3 servers the client may use. Servers are listed in the order of preference for the client to use. Network News Transfer Protocol (NNTP) Servers: Specifies a list of IP addresses of NNTP servers the client may use. Servers are listed in the order of preference for the client to use. Default World Wide Web (WWW) Servers: Specifies a list of IP addresses of World Wide Web (HTTP) servers the client may use. Servers are listed in the order of preference for the client to use. Default Finger Servers: Specifies a list of IP addresses of Finger servers the client may use. Servers are listed in the order of preference for the client to use. Default Internet Relay Chat (IRC) Servers: Specifies a list of IP addresses of Internet Relay Chat (IRC) servers the client may use. Servers are listed in the order of preference for the client to use. StreetTalk Servers: Specifies a list of IP addresses of StreetTalk servers the client may use. Servers are listed in the order of preference for the client to use. StreetTalk Directory Assistance (STDA) Servers: Specifies a list of IP addresses of STDA servers the client may use. Servers are listed in the order of preference for the client to use.